Below is a list of dates and times for 2019 Easter egg hunts and events in the Valley. We will add additional communities when dates and times become available. Do you know of a public Easter egg hunt that isn't listed below? Submit an Easter egg hunt event. Southern Park Mall, 7401 Market St.
To celebrate the Easter Bunny’s return, Southern Park Mall will host an Easter Bunny Arrival Event featuring the Doodle Who Show – a whimsical Dr. Seuss-inspired show at 11 a.m. March 30 at the Center Court Stage. An Easter-themed craft station hosted in partnership with KidX will also be on-site for children to create charming treasures from 11 a.m. to 1 p.m. April 13. Saturday, April 20 from 12 p.m. to 3 p.m.
Columbiana Nazarene Church's monthly luncheon is hosting an egg hunt. The lunch is free to everyone. The menu this month is ham, cheesy potatoes, salad, rolls, fresh fruit and desserts. Open daily from 9 a.m. to 9 p.m. and from 10 a.m. to 5 p.m. Sundays. But from March 29-April 20 hours are daily from 10 a.m. to 8:45 p.m. and Sundays from 10 a.m. to 4:45 p.m.
-- March 16 from 10 a.m. to 8:45 p.m.
-- March 17 from 10 a.m. to 4:45 p.m.
-- March 23 from 10 a.m. to 8:45 p.m.
-- March 24 from 10 a.m. to 4:45 p.m. The display is inside Kraynak's, which is located at 2525 E. State St.
Shenango Valley Mall, 3303 East State St. The Easter Bunny will be available for photos at the mall. Saturday, April 20 at 11 a.m. The dyes are prepared with herbs, vegetables and other edible plants. Space is limited -- materials are first come, first served. Children can get their photo with the Easter Bunny. At 1 p.m. March 30, the Easter Bunny's arrival will be kicked off my a comedy magic show by Magician Bill Gang. The Easter Bunny will arrive at 1:30 p.m. via the All Smiles Aboard train. First United Methodist Church, 608 N. Crandon Ave.
Saturday, April 20 at 9 a.m.
Eastwood Mall Concourse, 5555 Youngstown Warren Rd. Activities are for children ages 11 and under. Tickets are $1 per child. Tickets are available at the mall office or at Rust City. There will be about 50,000 eggs, bounce houses, face painting and crafts. Niles Nazarene, 1822 Vienna Rd. Egg hunt with snacks to follow. April 20 at 11 a.m. The Gate Church, 11836 South Ave. There will be 15,000 eggs to find, prizes and an adult egg toss. Ravenna City Park, 530 N. Freedom St.
Easter Eggstravaganza is a fun-filled day for kids of all ages! Welcome the Easter Bunny as he rides in on a fire truck. There are game booths and designated areas for children ages 1 through 10 to search for eggs, and an egg hunt for children ages 1 through 18 with disabilities. Plus, check out the annual Touch-A-Truck, featuring an amazing display that allows children of all ages to get up and close with the equipment and vehicles. For more information, go to their website. Saturday, April 20 at 12 p.m.
Creekside Gardens, 3680 North River Rd. Saturday, April 20 at 2 p.m. Hosted by Elim Christian Center. Light refreshments will be served. Enjoy the wonderful colors of spring during a 1-mile hike. 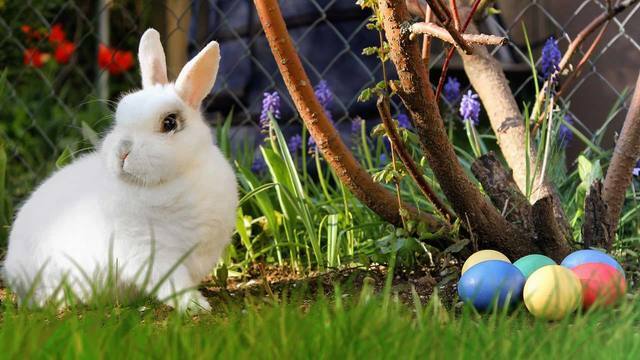 The Easter Bunny will be at Bears Den Cabin for a photo with your pup. Members receive a special Easter gift. The hike is free to all. Refreshments afterward are free to MetroMutts Members and $2 for non-members.